You won't see Stanley Tucci in front of the camera in his latest film, "Final Portrait." Instead, Tucci wrote and directed the film, which is based on James Lord's memoir, "A Giacometti Portrait," and stars Geoffrey Rush and Armie Hammer. The project, which has been in the works for 15 years, tells the story of Lord's portrait sessions with Giacometti and the various ways in which the two artists get intertwined in each other's lives. 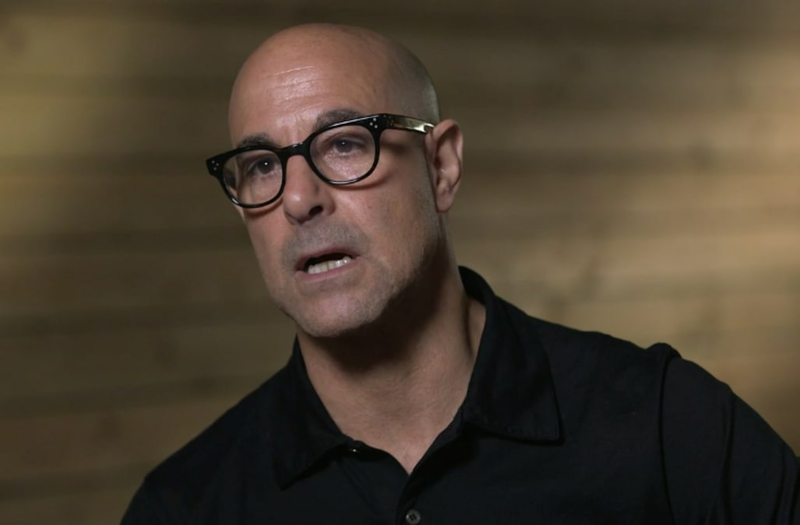 AOL's Gibson Johns recently caught up with Stanley Tucci to discuss "Final Portrait," how it came to be, his approach to being a director and how he created an intimate feeling on set. "Final Portrait" is based on James Lord's memoir, "A Giacometti Portrait." How did you get acquainted with this story and why did you decide to take it on as your latest project as a writer and director? I found the book when I was quite young -- many years ago -- and I really loved it. I love painting, I love art and I grew up with a dad who was an artist in New York. It was always around. It was something that I did myself and still do. I find it incredibly satisfying and time just disappears. It also informs everything else that you do. It forces you to take the time to really, really look at something -- whether that something is external or something within you -- and express it onto a piece of canvas or whatever. I loved this story, I loved James’ writing. It's the most beautiful book written about the creative process that I’ve ever read. Finally, years [after reading it], I got the guts to ask for the rights for it and I got them. It took me a couple of years to write the script, and that was like 15 years ago, so it took a hell of a long time to get this going. For me, it was something that I just had to tell. You have this amazing, small cast for this film, including two incredible performances by Geoffrey Rush and Armie Hammer. How did you go about casting it? Geoffrey was always somebody that was on my mind. There was a physical resemblance without question, and he’s a wonderful actor with a great sense of humor. Giacometti was very funny, and [Geoffrey's] very good at all sorts of dark humor, so he was [a] pretty obvious [choice]. There were a couple of people cast at one point through the years and attached to play James, but luckily we ended up with Armie Hammer, who was looking to do a more intimate film. I couldn’t be happier. He’s also one of the nicest people on earth. It was really, really fun. We spend a good chunk of the film during James and Giacometti's portrait sessions, for which you were able to create very intimate moments, with a lot of close-ups and silence. Talk to me about those moments and how you approached them. So much of it was right there in James’ book. It’s just a beautiful book. Sometimes you might just take a line that he writes and turn that into a long unspoken moment or an entire scene. To me, the moments of silence in this film are just as important as the dialogue. In fact, there was a lot more dialogue that I ended up cutting as we rehearsed, because we didn’t need it. Of course, a picture tells a thousand words, so you really didn’t need it. When we go into Giacometti’s studio, you basically just have a few minutes of silence. To me, that’s what happened, but also that’s what allows us to become intimate with the space and with the people. The dialogue would only get in the way. Because it’s very much a film about looking, I suppose I challenge the viewer to really look and take the time to look at those surroundings and become acquainted with them, because you’re going to spend the next hour here. And the viewer really feels like we're in those moments with them, and there's a kind of discomfort in dealing that silence sometimes. We don't know how to handle it. We expect a lot of information. I give you a little bit of information early on with Armie’s voiceover and that phone call he makes, but that’s it. That’s all you get, and that’s all you need. In fact, it’s a little too much, in a way. As the director, how did you go about setting that intimate feeling on set and setting the stage for the cast to get comfortable with one another? I like to rehearse it like a play when I do a film. We rehearsed for a week starting on a Monday, and at the end of that week we moved from a studio and trimming scenes into the set, which I asked to be ready by Thursday of that week. We started working with props and doing dress rehearsal, and then the next day we did a run-through of every scene with props and getting the lighting right, so that way when Monday morning came [around] everybody was very comfortable 1. with one another, 2. with the script and 3. with the space. And that way you’re shooting and saving so much time. We would shoot seven to eight pages a day in about six to seven hours. Lastly, there was a very subtle moment towards the end of the film when James is at a table with another man, and he's greeted with a kiss by Caroline and he says that he wishes she were a man. It was your way of alluding to James’ sexuality, and it felt very right and inconsequential. How did you go about incorporating his identity as a gay man into the film? I didn’t feel as though there was any need to hit it over the head that he was gay. He had left his lover back in New York and kept trying to get back to him, but to me that’s just the way James was. He didn’t go on about things. He was in the army intelligence in World War II, and the reason he ended up in Paris was because it was easier to live as a gay man in Paris than it was in New York or wherever. That’s where he ended up ultimately making his life full-time. To me, though, the focus really was Giacometti and his relationships, so could I have shown James’ lover and had shots of him at home? Yes, but you would’ve let the air out of it.